2. Click on the "Select Layout" button. The Configure Layout screen appears. By default, the page lists all possible layouts. The current layout is listed first with an asterisk. 3. Click on the filter radio buttons at the top to restrict the type of layouts shown based on the combination of preferences. 4. 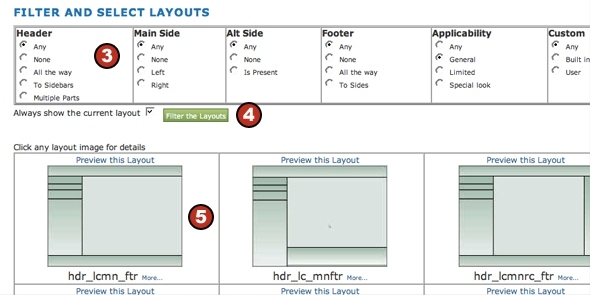 Click on the "Filter the Layouts" button. 5. Click on a layout thumbnail below to preview the website in the selected layout. At this point, it is just a preview of the selected layout, all visitors will not see the change(s). Changes to the layout will not be applied until the "Save Theme" button is clicked. 7. Click on the "Save Theme" button to apply the layout to the website, or click on the "Cancel Preview" button to close without applying the new layout to the website.